It's that time of year, when the sun starts making regular appearances in the sky and when I start to think about walks, camping and the great outdoors. Which means smartphone accessories that - ideally - prove really useful, doing multiple jobs with minimal bulk. 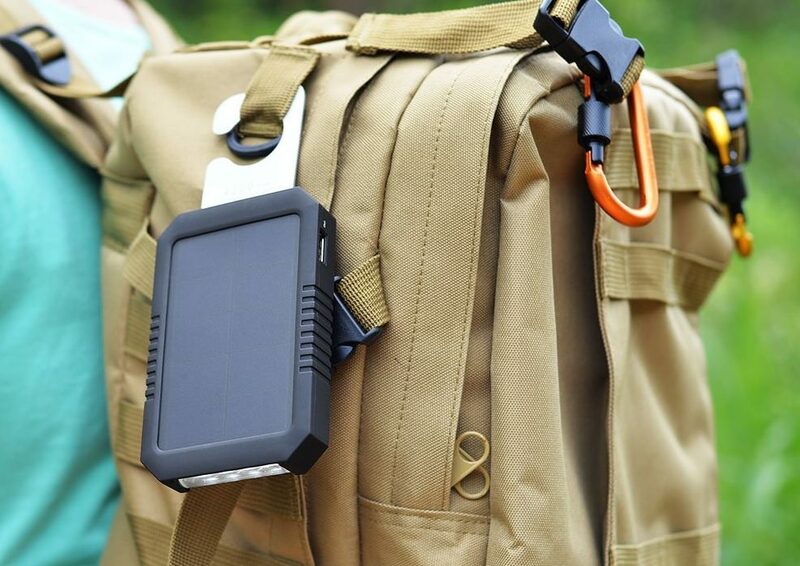 In this case, a USB power bank that you can leave facing the sun to charge itself from empty, and which doubles as a powerful flashlight or tent lantern. The smartphone aspect of this is, of course, the integral USB power bank. 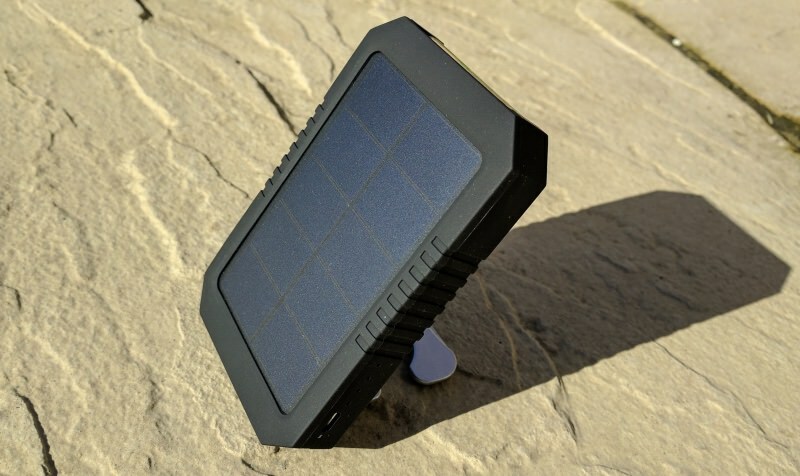 Solar energy in, stored in internal Li-Ion cells and then output to charge your smartphone via any convenient USB cable. Super-green and idyllic, right? Well, yes and no. 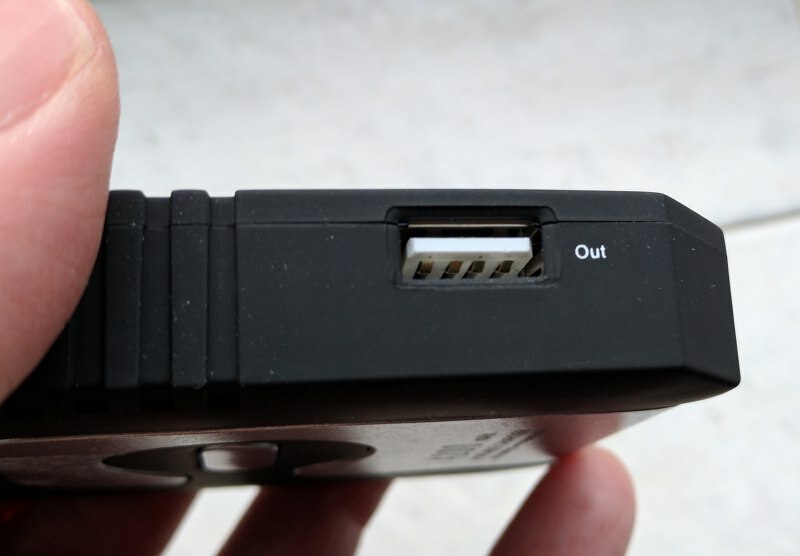 For starters, the power bank's USB output port is limited to 1A - this is slow by modern standards. Fine if you're leaving your phone plugged in overnight to this accessory, but no use for a quick top-up before heading down the country pub once the tent's erected. The other critical statistic, of course, is how long it takes to charge the internal 4200mAh battery from the sun. The solar panel is rated at 260mAh at 5V. 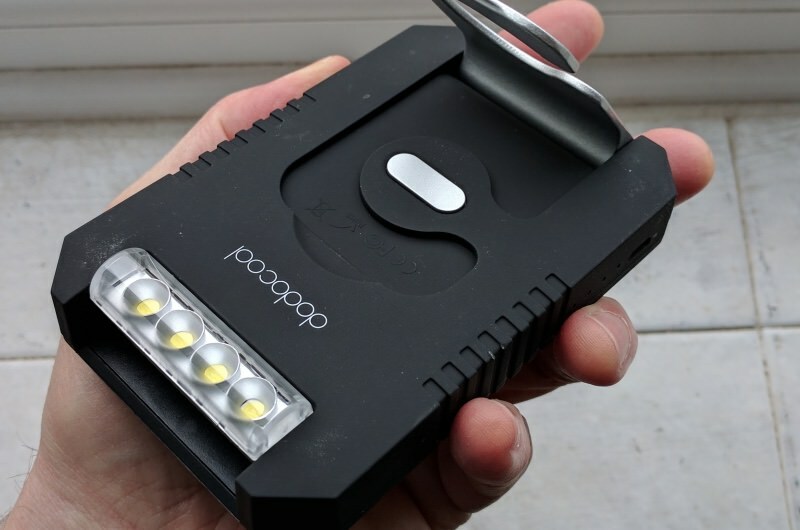 I left the dodocool accessory in the full Spring sun all day and it charged to around 50%, from empty, about what I'd expect. Now, there are some uncertainties here - the charge level in the power bank is +/-20% (there are just four LEDs to indicate state), plus the sun was low in the sky and certainly nowhere near the intensity/energy it would have in mid-summer. But the concept does work. The "maximum solar conversion efficiency (of) 22%" is enough that, in the height of summer, with blue skies overhead, and with the charger perhaps hanging off your ruck sack (in the direction of the sun), you might expect the power bank to be mostly charged by the time you set up the tent at the end of the day. At which point it could then charge a typical smartphone from empty - with, as the title suggests, power that came entirely from the sun. In practice, of course, weather is unlikely to be this perfect, plus you'll find it hard to keep the gadget facing the sun all day in a real world excursion. So the solar element is probably best thought of as keeping this power bank 'topped up' and assumes that you won't drain it fully each night. Which you probably will, since the 4200mAh here is just enough to charge one smartphone fully. And that's not to mention other USB-rocking gadgets that you might also want to charge, including those from other people on the trip. So keep your expectations lowered, this isn't going to power your electronics on its own. But that doesn't mean it's not very cool and working better than you might expect. You can also charge the power bank via a traditional (if old) microUSB port, at 1A again, so about a five hour recharge (i.e. overnight) at base somewhere from a mains charger, typically. All a little underwhelming, despite the green credentials. The other main feature is the swivelling bank of four high power LEDs. Together with the sturdy metal stand, these form the heart of what might be a very useful lantern on dark camping evenings, either self-propped up on the floor or hanging from a tent cross-pole. These are moderately bright, probably trying to steer a middle ground between being bright enough to be useful and dim enough not to drain the battery too fast. 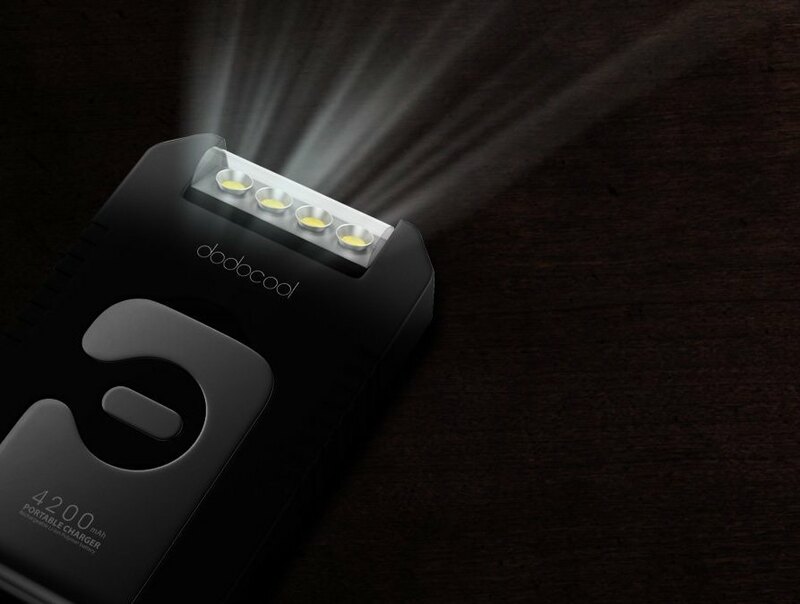 The LEDs accumulate to 1W and are supposed to stay lit for about 12 hours on a full power bank charge. Despite being a cool phone accessory for the outdoors enthusiast, I couldn't help but be a little disappointed. There's that 1A limit on input and output, which seems too low in 2017 - I thought 2.1A outputs were now more or less de rigeur? Then there's the 4200mAh capacity - I'd have hoped for a little more. Even adding a few mm to the thickness in order to raise capacity to (say) 7000mAh would be very useful. And, yes, I realise that this would take longer to charge, but remember that in many cases, the sun's just topping up an initial reserve of charge from the mains. Finally, despite the generally rugged build and looks, there's no pretense here at waterproofing - I'd have thought this would be a given in such a product. After all, which of us hasn't left a solar product outside, whether on a patio or tent or rucksack, and forgotten it, remembering after it's been out in the rain for an hour? Rubber plugs over the two jacks would have been trivial to engineer in and their absence is notable. So we have a cool accessory idea that ultimately falls a little short in real life. Here's hoping for a 'Mark II'! The dodocool Solar Charger is on the expensive side, at £22, on Amazon UK, though much of this is down to the pricey solar cells, of course. However, the suppliers have given AAWP readers a discount code of 18% off with promo code: R8LENDUS, valid until the end of March 2017 and bringing the price down to £18.